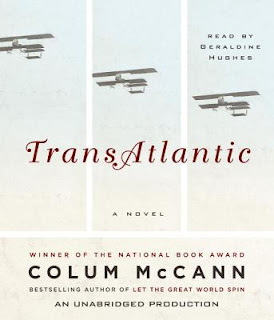 I don't usually write about DNF (did not finish) books on this blog, but must make an exception for TransAtlantic by Colum McCann. Let the Great World Spin, McCann's previous novel, was a favorite in 2010, so I had high hopes for this one. The fact that it recently appeared on the Mann Booker longlist further heightened my expectations. A few weeks ago, I downloaded the audio version of TransAtlantic from audible.com. McCann's beautiful prose is again apparent from the opening passage. After the first few pages, we are drawn back in time. The structure appears similar to that of Let the Great World Spin - seemingly unrelated stories eventually connect for, what I hoped would be, a fabulous conclusion. Unfortunately, I never got that far. The first thread of the narrative, set in 1919, tells the story of two aviators attempting the first nonstop flight across the Atlantic Ocean, the second thread (1845-46) focuses on Frederick Douglass in Ireland, and the third features Sen. George Mitchell in 1998. Unfortunately, I did not fully engage with any of the stories. The audiobook narrator, Geraldine Hughes, was perfectly acceptable, so the production itself was not the problem. I borrowed a print copy from the library hoping it would help me become more involved but, after 100 pages, I simply did not care. However, I soldiered on a little longer, rather than "waste" one of my audible credits. I mentioned my growing disappointment in a Sunday Salon post and received several comments about audible's generous return policy. Basically, you can return a book for any reason up to one year from the purchase date. Now I've been an audible.com member for a decade, yet have never tried to return a book. In fact, it almost seems wrong to return one for no other reason than "I just couldn't get into it". But audible is committed to providing the best listening experience possible and TransAtlantic was really a double disappointment for me - first in not caring enough to finish a book I expected to love and second for wasting a precious listening credit. So, I sent an email to customer service and within a couple of hours received both a polite reply and a credit. How's can you not love this company? This is also a good time to mention that I'm finally experimenting with the new(ish) Whispersync for Voice feature on The Age of Innocence by Edith Wharton. With the Audible App on my iPhone, I listen on the treadmill or while walking the dog, then when I open my kindle to read, it syncs to the spot where I stopped listening. 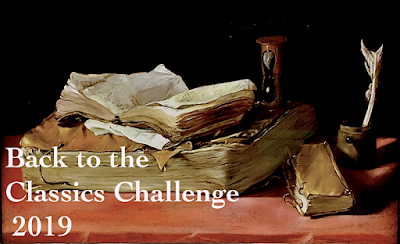 This is ideal for readers like me who enjoy the experience of a read/listen combination. Audible is currently offering the Whispersync for Voice Classic Collection for just 99 cents. 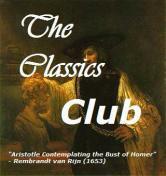 You can download one of 108 free classics to your kindle and then get the audio version 99 cents. This is truly a classics lover's dream! Have I mentioned how much I love audible.com? I loved Let the Great World Spin but have read one to many lukewarm reviews of Transatlantic. I'm probably going to skip it. Good for Audible though. That is a company than knows how to build a loyal customer base. Sorry the book was a disappointment for you. Someone gifted me a book on audible and I thought the listening experience was terrific! I'd love to have a subscription but don't want to pay the monthly fee. Kathy - I did like the narrator, but didn't seem to have the patience to let the stories develop. Glad you enjoyed it! Yay for you for returning it! And I'm jealous of your Whispersync, but I'm going to make a pot of tea, curl up with my hardcover, and love every minute of reading The Age of Innocence with you! Audrey - I especially love read/listen combinations for classics. The Age of Innocence is wonderful so far, I'm beginning chapter 7 today. 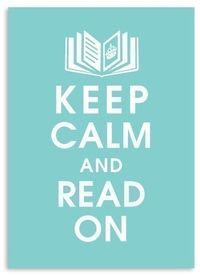 So glad you're reading it, too! 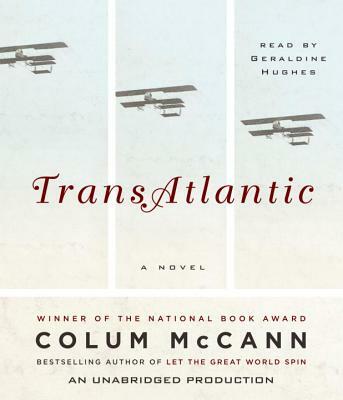 I had not heard of Colum McCann before, but I was excited to read TransAtlantic, because it brings together two of my interests, early aviation and abolitionism. But I didn't even make it to the second chapter. I'm glad I got a library copy first, and I also applaud Audible for great customer service. Lisa - If you ever decided to give McCann another chance, I highly recommend Let the Great World Spin. Although it doesn't involve either of those interests, it's an excellent read ... and listen!! Sandy - You know, I loved The Devil in the White City on audio, too, but have seen too many negative reviews of In the Garden of Beasts to even want to try it. Sigh. "Whispersync for Voice - Add the professional narration of House of Mirth for a reduced price of $0.99 after you buy this Kindle book." I have TransAtlantic on my Nano, but I think I'll skip it and instead download the audio of Let the Great World Spin from my library. I trust your opinion! Glad Audible came through for you. I've been tempted to join, but my library has kept me busy with their downloadable audios, thus far. Les - If you have the opportunity to try Let the Great World Spin, I'd definitely recommend listening to that first. Can't help but wonder if TransAtlantic would have hooked me if I'd been a little more patient, but 100+ pages sure seemed fair enough! Vasilly - I'm SO happy with audible's customer service! I know audiobooks aren't for everyone.. in some ways it seems like a skill that fits very well with auditory learners. I, too, was a big fan of Let the Great World Spin and had been really excited for Transatlantic, especially for the historical aspect. After hearing several reviews similar to yours, I decided I would at least wait until it came out in paperback...but now I'm not even sure I'll pick it up at all. Great to hear that Audible is so good at holding up that pledge, though! Shannon - I certainly don't want to discourage anyone from reading (or listening to) TransAtlantic, but definitely recommend waiting for the paperback or borrowing it from the library... just in case. I've always been a big fan of Audible, but this latest customer service experience has definitely kicked it up a notch! Audible.com customer service IS amazing. I am sorry this one didn't work for you, but hope you'll find a fantastic use for your next credit! DNFing is sometimes a difficult call to make. I've struggled with a few this year, too. Luckily they were only library books, but still. Glad Audible came through for you! Good customer service wins me over every time. Wow, I think you've just convinced me to try Audible. What a fantastic customer service policy! I've always found Audible has amazing customer service, and so have my friends. Ironically, of course, I've seldom had to use it, because their service in general is so good. Serenkitty - I've haven't used their customer service much over the years either, but this was very quick and efficient and pleasant. They even sent a follow-up email to make sure I was satisfied with the resolution! What a great company. I don't listen to many audiobooks, but Audible sounds wonderful for people who do. I have pondered, though, starting a walking habit in the evenings and listening to an audiobook on my phone would make it more palatable, I think :-) I am listening to Then Again by Diane Keaton in my car and I highly recommend it. She narrates it and it is a really interesting and inspiring book. Anbolyn - Audible really is the best. I've found that a good audiobook keeps me walking much longer... definitely good motivation! I like Diane Keaton and will keep her book in mind. Thanks. I couldn't finish Transatlantic either. It is good to know I'm not alone, but it is also good to know that you loved Let The Great World Spin - I haven't tried his first yet and was worried I might not like either of his books. Jackie - I thought I remembered that this was a DNF for you, too! What a disappointment. Let the Great World Spin was such a wonderful book. I do hope you decide to give it a try one day. I'm with you on Audible. I love them as well. They have great prices and promos and that return policy is one you can't beat. I haven't had to return one yet but you never know. Darlene - Isn't audible the best? They were so quick and responsive... hard to beat service like that! I just listened to my first book from Audible, and I loved the experience! I'll have to keep the Whispersync for Voice feature in mind. Diane - I love audible, but have been previously listening through iTunes. Now that I have the audible app on my phone, I can finally make use of Whispersync - love it! Considering the time I have available for listening to books (it's sad, really) I can't justify an audible subscription, BUT I love the customer service and I try to support companies that do the right thing. I'm reading a book now, Brewster by Mark Slouka, that has a praising blurb from McCann on the cover and a conversation between the two included in the back. If you are interested after I'm done I could send it to you. I love audible but didn't know their customer service was THAT good - it's nice to know that they stand behind their products and service that way. Colleen - I can't think of another company with customer service that good! !